Nigeria is blessed with large tracts of arable land which makes agriculture an important sector of the economy with high potential for employment generation, food security and poverty reduction. 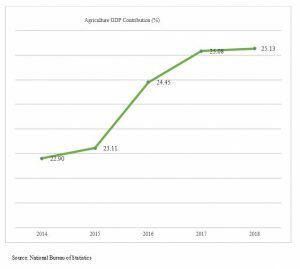 Although the sector was largely dominated by subsistence farming, with improved seedlings, modern farming methods and better weather forecasting, agricultural yields have continued to grow. These improvements have been driven by government policies which are aimed at encouraging more commercial and mechanized farming. These policies leverage Nigeria’s agricultural ecosystem to transform the country into a leading agribusiness and agro-allied industrial nation. Agricultural sector contributes 25% of Nigeria’s Gross Domestic Product (GDP) and accounts for 48% of the labour force. The sector’s growth rate over the last 5 years averaged 4%. 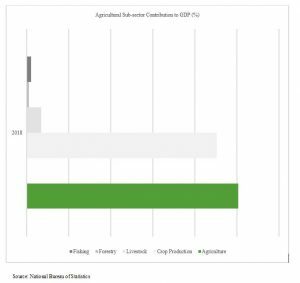 Crop production dominates the sector, accounting for 22.6% of GDP alongside livestock (1.7%), fisheries (0.5%) and forestry (0.3%). Nigeria’s agricultural zones, which stretch from the tropical savanna in the north to the coastal rainforest in the south, and the mangrove of the Niger-delta complemented by tropical and semi-temperate weather prevalent across the country, promote the cultivation of a wide variety of agricultural produce from exotic fruits, vegetables, tree crops to root crops. Towards maximizing this nature’s gift, government has mapped-out soil characteristics across the country and provides detailed daily report on prevailing weather conditions. The development framework for the sector is encapsulated in the Agriculture Promotion Policy 2016-2020, which itself built on the successes of its predecessor, the Agriculture Transformation Agenda 2011-2015. The policy document set out specific strategies for key stakeholders to build an agribusiness economy capable of delivering sustained prosperity by meeting domestic food security goals, generating exports, and supporting sustainable income and job growth. 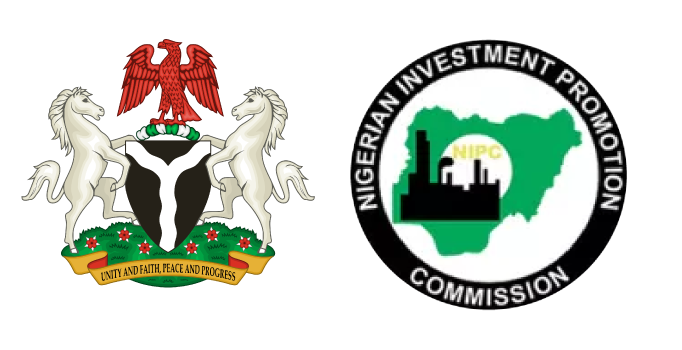 creating a mechanism for improved sector governance by the supervising government agencies. Mechanized crop production such as rice, maize, millet, cassava, sugar cane, tomato and the cash crops such as cocoa, palm kernel, rubber, among others. Agricultural input supplies and machinery. Water resources development especially for irrigation and flood control infrastructure. Development and fabrication of appropriate small scale mechanized technologies for on-farming processing and secondary processing of agricultural produce. Development of private irrigation facilities. Production of improved seeds and agro-chemicals. Production of veterinary drug, vaccine, chemical, feeds and feeds ingredients. Increased tariff with additional levy on any commodity that Nigeria produce (rice, starch, sugar, wheat, tomato etc.) to promote domestic production and local content. Exemption from Value Added Tax (VAT). Access to Agricultural Credit Guarantee Scheme which is up to 75%. Huge demand gap between the supply of agricultural produce and the industrial activities.